...that an Elite named Zuka 'Zamamee hunted the Master Chief across Alpha Halo? ...that Corbulo Academy of Military Science was a UNSC military academy mainly attended by the offspring of high-ranked officials? ...that damaged organs can be replaced via flash cloning technology? Maria prepares to throw a mock grenade. 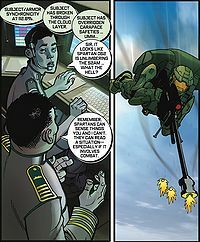 Armor Testing is the second story in the Halo Graphic Novel, written and illustrated by Ed Lee, Jay Faerber, and Andrew Robinson. 062 equips her Sniper Rifle and fires, as UNSC officers watch in awe. Maria-062 stands in a Pelican dropship in a low orbit around Earth, awaiting for permission to commence an orbital drop from an unnamed UNSC senior officer. On the Captain's mark, Spartan-062 leaps from the craft and plummets towards the Earth. Meanwhile, ONI personnel at the Special Warfare Center in Songnam of the Kyonggi Province monitor Maria's biosigns and her MJOLNIR Mark VI, which is being tested. Shortly after breaking through the cloud layer, Spartan-062 overrides the carapace safeties and withdraws her SRS99C-S2 AM Sniper Rifle, and opens fire upon a group of holographic Covenant troops. At an elevation of 4,000 feet, the Air Foil Carapace opens and Spartan-062 glides to the surface as her Parafoil opens, only to ditch it a little earlier than planned due to the hostile presence. Upon landing, Spartan-062 is immediately attacked by two ODSTs, one opening fire with an SMG loaded with paint pellet rounds and the other lunging at her with a Humbler stun device. Spartan-062's energy shields flare and she reacts instantly. Grabbing the wrist of the ODST wielding the Humbler, Spartan-062 uses him as a human shield, simultaneously delivering a powerful kick to the ODST with the SMG. The other ODSTs open fire, but are absorbed by the hostage ODST's suit. The Spartan ditches the ODST as the rounds strike her body and rolls for cover behind some rocks. As the ODST with the Humbler struggles to scramble back to his feet, Spartan-062 hurls a Fragmentation Grenade into the middle of the ODSTs, neutralizing Echo One through Five. The sole survivor of the blast, Echo Six, makes a run for it and he's quickly "gunned" down by Maria, but not before initiating the "Bulgogi Gambit". Maria's boot steps on the floor of the building. Maria runs past his "body" and leaps into a building, designated structure Alpha-Two, through an open window, kicking aside the ODST gunner positioned there as she swings inside. An ODST just outside the door thumbs a detonator and the room Maria is in bursts into flames. Maria, unscathed by the flames that are deflected by her shields, follows him in pursuit and into a group of waiting ODSTs who apparently subdue her. Back at the Special Warfare Center, Spartan-062 walks in without a helmet followed by ODSTs during the combat exercise. Maria and the unnamed senior officer exchange salutes and discuss the performance of the armor, which is to be shipped to Master Chief Petty Officer John-117 upon receiving her seal of approval. She is very happy at hearing this. The senior officer also tries to persuade her into re-enlisting, but she politely turns down the offer, stating that she wants to start a family. One of the ODSTs attacking S-062 with a humbler. Maria firing paint pellet rounds from two SMGs. Flames flicker about Maria's shields.